We can supply newly manufactured as well as reconditioned commercial quality 16 gallon through 55 gallon drums. 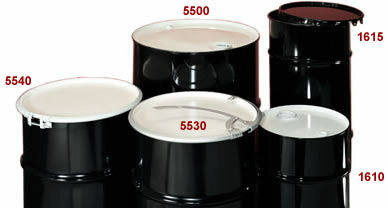 We carry UN and non-UN, open-head and closed-head drums with a variety of fittings and optional features. The 85 gallon salvage drum accommodates the 55 gallon drum while in transit. Steel drum pricing is subject to change and may not be immediately reflected on the website; please inquire for current costs.